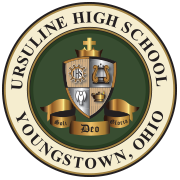 The Ursuline High School Chapter of the National Honor Society inducted 40 members of the junior class, the Class of 2020, to the chapter during Mass on Wednesday, March 20 at Ursuline High School. Father Richard Murphy presided the Mass. National Honor Society members were presented by their advisor, Mrs. Nannette Jacobs, to Principal, Mr. Matthew Sammartino. Students were chosen for the organization based on their scholastic performance, extracurricular involvement, and service to community and church. Students were presented with certificates for their achievement and recited the National Honor Society Oath. A celebratory reception was held at Ursuline for the newly inducted members and their guests following Mass. Please visit the Photo Gallery to see photos of the induction.